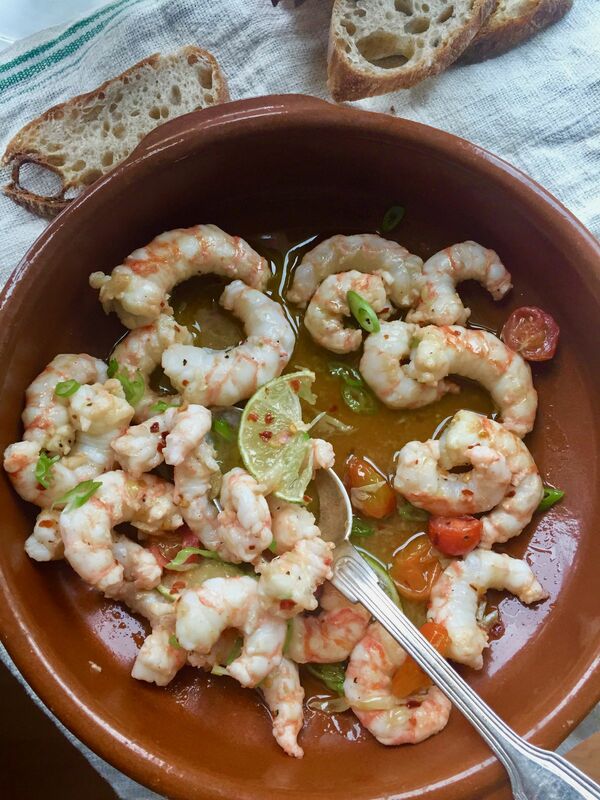 Just when spring has me cooking up fresh vegetable-forward fare — peas and favas with mint, fresh garbanzos and braised artichokes, roasted radishes — I happen upon the first-of-the-season Alaska spot prawns. These are hard to resist — big, juicy, sweet and delicate creatures from the pristine waters of Prince William Sound. I've done everything with them, from curing in soy sauce to tossing with semolina and rice flour for a light fritto misto. But when the ingredient is this fresh and delicious, it's good to remember that less is more. Here, just plump garlic cloves, a hint of chili, and olive oil and citrus make for a quick and delicious meal. You can peel them before cooking or leave the shrimp with shells on; if you leave the shell on, they might need to cook an extra minute or two. Serve with crusty bread for dipping in the sauce or a simple green salad; stir into a risotto or toss with pasta. Place a large sauté pan over medium-low heat. Pour in the olive oil, add the garlic and chilies and let the oil heat and infuse with the garlic and chili, about 3 minutes. Pat the peeled prawns dry with a paper towel to remove excess moisture. Increase heat to medium-high and add the prawns. Let cook, gently shaking the pan as needed, about 3 minutes and until prawns start to turn pink. Shake pan and toss shrimp; let cook another minute or until just done; be careful not to overcook. Add lemon juice and lemon slices. Garnish with green onion or parsley, a little salt and pepper and another drizzle of good olive oil.